As someone engaged in asking questions about land and its ownership, I have always been aware of the paucity of academic study of land tenure and ownership. That striking absence has, in part, motivated my ongoing investigations. So it was with a sense of anticipation that I noted some years ago that the Centre of Mountain Studies at Perth College/UHI was to undertake research into landed estates in Scotland. A project entitled Sustainable Estates for the 21st Century began in 2007 with the overall aim of “integrating the concept of sustainability into the management of large, upland estates in Scotland”. My interest, however, quickly faded when I learned that the research programme was not acutally going to query the legitimacy of the current division of land or its ownership but merely investigate how they can be made more “sustainable”. This line of inquiry takes the rational and existence of such landholdings as a given. Now universities are perfectly entitled to pursue what questions they deem appropriate. But sometimes it is worth asking why academics ask the questions they do. In particular, who is funding the research. Before we proceed any further let me make it clear that I am not calling into question the academic rigour or quality of the actual research that has been carried out. I am not qualified to do so and so have no view on the matter. I have met the researchers and they have gone about their work with diligence. The Sustainable Estates website states that “The Sustainable Estates for the 21st Century project was generously funded by the Henry Angest Foundation.” So who is Henry Angest and how did this relationship come about? Turns out he is one rather interesting fellow. Henry Angest is a banker and was born in Switzerland. He was an international executive with The Dow Chemical Corporation in Europe, USA, Latin America and Asia. 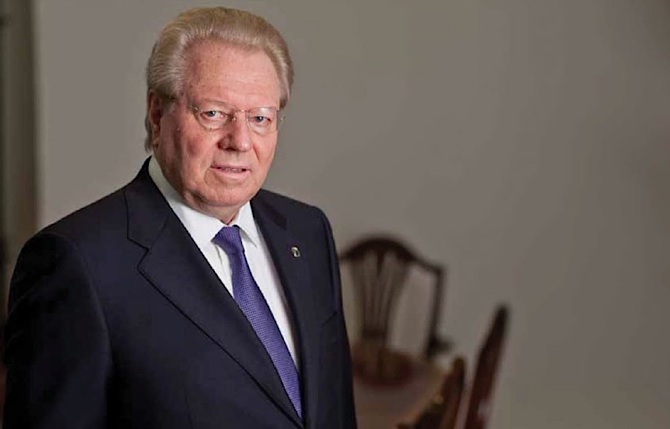 Currently, he Chairman and Chief Executive of Arbuthnot Banking Group and is a former master of the Worshipful Company of International Bankers. He and his wife, were named as having had dinner with The Prime Minister in the wake of the cash for access row in March 2012. According to an Observer investigation, Angest has provided almost £7 million to the Conservative party in loans and donations between 2001 and 2010 (1) He was also a funder of Atlantic Bridge, the charity that funded Adam Werrity’s excursions around the world with Liam Fox. He also owns Ashmore estate in Perthshire under the name of Rora investments Ltd., a company registered in Jersey. Which leaves me with something of a dilemma. Material released under FoI is considered to be in the pubic domain but may still be subject to copyright restrictions. I propose therefore to tell you what is contained in the documents rather than reproduce them. The documentation consists of emails and letters. There is a fair amount of redaction. The relationship between what was originally Perth College (now UHI) and Henry Angest begins in November 2005 with a donation by Angest to the Perth College Development Trust. This is followed by a meeting between Angest and Perth College Principal, Mandy Exley. She follows this up by a letter, the first paragraph of which is redacted but which goes on to state that “I fully appreciate your views about the direction and tone taken by the Scottish Executive” before mentioning research on estates that the College is proposing to undertake. By August 2006, Perth College are highlighting the tax refund that Mr Angest can expect as a higher rate taxpayer (18% of the donation) and proposing that he be made an Honorary Fellow of the UHIMI (University of the Highlands and Islands Millenium Institute – UHI is not at this stage a University). Angest replies saying that he beleives the Sustainable Estates research Project is “very important for Scotland” and poses questions about the timetable for University status and about how one is proposed for an honorary degree. At this point it is worth noting that the research is designed to look at “benefits” and how estates “fulfil their diverse roles” The hypothesis that estates may provide no benefits, may even harm local communities, and may not fulfil any useful role at all is not to be subject to any inquiry or analysis. On 21 September 2007, Henry Angest received his Honorary fellowship at Blair Castle. By early 2008, research students had been recruited and had begun work. By early 2010, the question of further funding arises and Angest writes to Professor Martin Price, the Director of the Centre for Mountain Studies to lay out two issues. The first is redacted in its entirety. The second is revealing. Of course, Mr Angest, as a private donor is perfectly entitled to give money to whomsoever he likes but in this statement is revealed a motive that is inappropriate in any private donor – namely that they wish to be assured that the outcome is not “wrong” or “unacceptable.” It should be obvious that such reassurance can never be given since it is impossible (or should be) to know at the outset what the results of any inquiry will be. Professor Martin Price, in the 10th annual report of the Centre for Mountain Studies, thanks Henry Angest “for financing what will, I hope, be regarded as a landmark study on estates.” (7) I’m not sure it will tell us anything of any great import. However, the fact remains that this is the most substantial research programme on Scottish “estates” in recent decades and yet begins from the premise that such landholdings are a given. The inquiry fails to consider a range of issues central to a critical understanding of their role and function such as succession law, taxation, land tenure, the role of charity law, offshore trusts, trust law and the peculiar fact that these estates are exempt from business rates. Mr Henry Angest has not, at the time of writing, been offered an Honorary Doctorate. This is important what you are saying, and pretty clear. 1. There is no justification for giving academic honours to people whose intellectual work in the wider community has not justified it. We cannot have Scottish universities engaging in academic “cash for honours”. 2. When research is funded at a university, part of the university’s intellectual and material capital is reoriented towards what is being funded. There is a powerful grassroots feeling in Scotland that landed power is a theft from the peopleâ€™s resource base. The question must therefore arise as to whether such donations have been examined by the university’s ethics committee, and if so, what criteria have been applied to ensure that this is not just landed power doing the academic equivalent of greenwash, or the laundering of ideas. 3. A private estate is, under current law, a legitimate entity, but the UHI owes it to its Highland constituency “the survivors of those who were cleared by landed power”, to show that this really is in the public interest. Having studied at CMS at the same time as the research being undertaken, I can only say from a personal perspective that the research outcomes look pretty useful for estates wishing to take a more sustainable perspective on their activities. The nature of academic research being what it is cannot necessarily include all aspects of the ills of the world, however interlinked with how we got here in the first place. This often comes under the heading of inconvenient externalities. I came across this my self during my own masters studies when I realised that while sustainable development cannot seriously be discussed without social issues of justice and power, it was impossible to stay within the word count if I had gone there too deeply. Thanks Andy for opening out the issue of funding transparency though. Its important to know where the money comes from. Thanks for your thoughtful comments, Simon. I do agree that the research will be useful within the parameters set. I just don’t like seeing those parameters become ever more firmly entrenched. Sad to say, I’ve come to the conclusion that every academic study, should include a mandatory statement listing the source of funds. Thank you for such a well researched article into academic wheeling and dealing. It is shocking but not surprising that individuals like Angest can buy their way to advantage in just such a way. It is also reprehensible that the superiors in one of our chief colleges can be bought like whores. Our estates should not be allowed to be bought and sold in such a piratical manner, nor should the results of reports be bought, nor academic honours an individual has no right to. In a documentary on land issues in Scotland a number of years ago a rich Danish land owner here said that territory would not be so free to abuse in Denmark, but in Scotland they can get away with it. According to the Sustainable Estates website you linked to, it looks as if the research involves comparing aspects of privately owned with community owned estates. That will be very interesting (to me anyway). That said, the Henry Angest involvement is most revealing and you do right to flag it up. It does look a bit like HA funded the research in the hope of producing the result he wants, namely private estates = good, community estates = bad. But shouldn’t you wait for the research to be published before you prejudge it? I wouldn’t pay any attention to that copyright warning from UHI if I were you. It’s just like the standard yadda-yadda at the end of e-mails drafted by over-zealous lawyers. If it’s got any meaning at all, it’s probably just a reminder that things like company logos etc. may be copyright. I would just publish the whole lot anyway. What’s the worst UHI can do to you? Sue you? I don’t think so! 1. What was UHI’s reaction to the letter from HA threatening to withhold further funding until he’d seen the results of the research to date? 2. Was there a further tranche of funding from HA or not? 3. And if not, does the stuff you got under FOI reveal why not? Will try and answer this when I have a moment. Prompted by your tweet on this, are you yet able to answer my questions? 1. I don’t recall. 2. Don’t think so. 3. I don’t think so. Need to look at the material again but don’t have time just now. Am planning to publish it all soon in any case & then you can work out the answers for yourself. 1. Nothing substantive was said though there are many redacted passages. 2. Not as far as I can tell from the released material. 3. it is not clear whether there would be further support or if there was, why this was not forthcoming. I have decided not to publish the released information until I have more confidence that UHI will not pursue legal action. Who is Henry Angest? Whilst he’s clearly the antithesis of an Andy Wightman or Alastair McIntosh, Angest uses the power of his money to influence and mould thinking, you and Alastair use the power of your pen to influence and mould thinking. Not a lot to distinguish but it evens the war of words. Andy you are totally right about the issue of setting parameters that then become an excuse to ignore the ‘inconvenient externalities’. This is a common human trait and allows us to say we are ‘doing something’ when actually we are dodging the fundamentals. eg that the reason why highland estates are in such degraded state in the first place is due to the patterns of ownership as much as management. That, in itself, is an endgame comment. Which makes it all the more important to know what the UHI’s response to this blackmail was. And makes it all the more bewildering that Andy didn’t bother to identify this when he was sifting the FOI material he received and writing this blog entry. Patience. Am hastily preparing for day long workshop tomorrow, two lectures on Sunday and a field trip on Monday. In the diary to revisit Tuesday. Ne obliviscaris (Don’t forget) – Duke of Argyll’s motto.